Co-founder of the Miami Guitar Trio, Federico Musgrove Stetson, born in Buenos Aires, Argentina, started playing guitar at the age of twelve. In 2001, he moved to Miami, Florida and decided to pursue a career in music. Although having been trained as an electric guitarist, he decided to focus on classical guitar. In 2007, he graduated from the University of Miami where he completed his Bachelor’s Degree in Music performance. 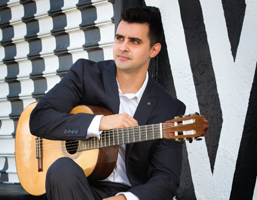 His most recent performances include solo recitals, appearances with the Miami Guitar Trio, the FIU Symphony Orchestra, the Henry Mancini Institute Orchestra, and the New World Symphony. Mr. Musgrove is currently pursuing his Doctor of Musical Arts Degree at the University of Miami under a full scholarship and Teaching Assistantship. Federico is currently the head guitar instructor at Music Instruction Specialists, in Miami, and also founding President and Executive Director of the Florida Guitar Foundation.